Google has their hands in almost every aspect of the web. They have a free web tool for pretty much everything the average person could need. In my opinion, one of the most versatile Google tools is the iGoogle homepage. I say this because it can be configured just the way you need it to be. The parts of the page which you can configure easily are tabs and gadgets. Gadgets are the little windows that contain information such as RSS feeds, information, games, applications, notifications and just about anything you can cram into it. The gadgets can be expanded to a larger window if you would like to see more information. The RSS function is very handy if you don’t have a feed reader you frequent. In many cases you can quickly add the feed to your iGoogle page by clicking on the subscribe to RSS link. This will put a new gadget on your page and be updated with the 3 most recent updates. To save you from needing a bunch of apps open or toggling through multiple tab or windows in your browser, you could add gadgets for your social networking and bookmarking sites. Take a look in the gadget directory for some ideas of things to add. Adding a whole new tab gives you a clean slate to add new gadgets. Grouping similar gadgets in the same tab creates a smoother less distracting homepage. Many of the Google applications have a gadget. Gmail, Calendar, Docs and even Waves can be viewed on your homepage. This can save a little time jumping from page to page looking to see what’s new. One good example of new tab full of gadgets making things easier is when you add Google Webmaster tools. It adds a new tab and a gadget for each of the webmaster options. Adding a Wave gadget is a little bit of work, but it can be done. It took a little bit of digging to find one that worked reliably. These steps are the easiest way I could find to add a Wave. 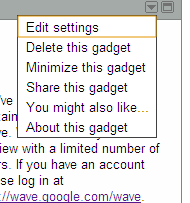 The first thing you will need (aside from a Wave account) is the Wave gadget; you can download it here. 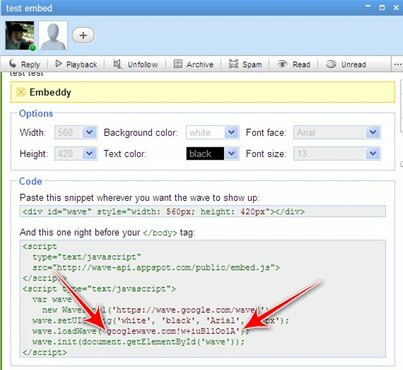 Next you will need to add Embeddy@appspot.com to your Wave contacts. Do this by clicking on the [+] next to your picture at the top of the wave you want to embed. A window will pop up asking who you would like to wave with; add Embeddy@appspot.com. 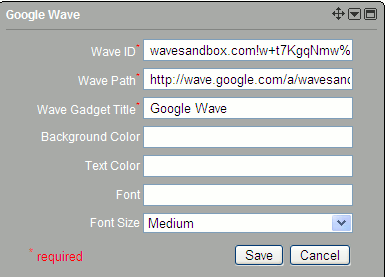 Copy the wave ID and go back to the settings for the wave gadget on your iGoogle page. After you save it, the gadget should reload and your wave should appear. At this point you can close the embeddy window because you do not need anymore information from it. Your wave should operate the same as it does in it’s original location. Backing up and restoring your tabs is a good idea if you have several set up for specific uses. To back up or restore your information manually, click on the dropdown arrow to the left of the active tab name. Click on [Edit this tab] and scroll all the way to the bottom. You will see the last automatic back up time along with an option to back up or restore your iGoogle settings to your computer. Click [Export] and save the XML file to your “in case of a crash” folder. Do you have a good assortment of gadgets on your iGoogle homepage or do you use something totally different? 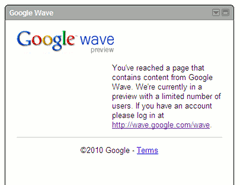 Google Wave – The Future of Email?